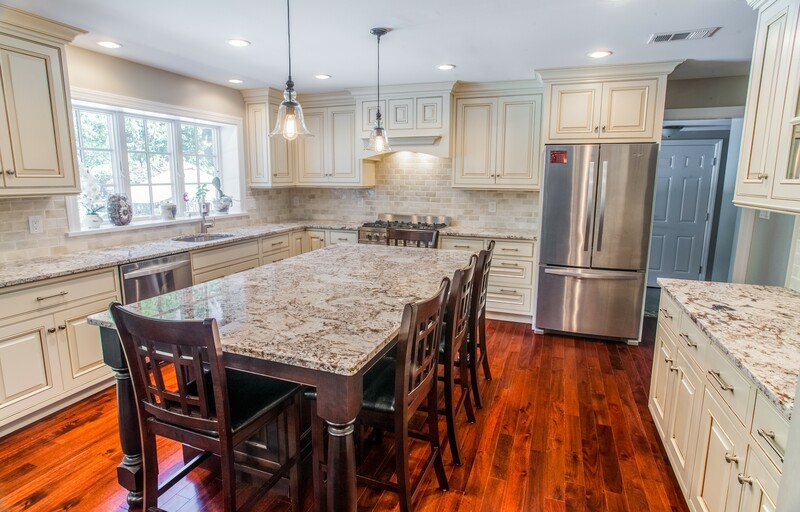 Granite vs Marble for the Kitchen: How to Decide? When it comes to choosing between granite and marble, I used to always tell customers, granite is the better option because it’s more durable than marble. “Everyone wants that marble look,” I’d say. “But I advise you to buy granite because it stands the test of time and doesn’t require as much maintenance as marble does.” But when it came time for me to pick a countertop for my kitchen, I suddenly wasn’t so sure. My wife and I recently bought our first home, and the kitchen wasn’t in bad shape, but its laminate countertops looked like something from the disco era. My wife and I agreed that an upgrade was needed. After all, I work for a kitchen countertop company. I should have nice countertops, right? After looking through all the countertop material options my company offers, my old advice didn’t seem to ring quite so true anymore. I wanted that marble look! There’s just something about the elegance of marble that gives it the edge over granite aesthetically. But how could I choose marble after telling so many customers over the years that granite was the way to go? Well, it turns out my old advice was an oversimplification. To get to the core of the matter, let’s start with the basics. Marble and granite are both beautiful stones that occur naturally in the earth. However, marble is softer than granite. It’s a metamorphic rock that forms over millions of years from the accumulation of dead sea life being subjected to heat and pressure beneath the seabed. The layer of dead sea life metamorphizes into limestone — a soft mineral that usually contains fossils. Fast-forward a couple more millions of years of sustained heat and pressure, and the limestone metamorphizes again — this time into marble, like an unassuming caterpillar becoming a beautiful butterfly. Marble is typically white with gray or black veins, but a few other color options are also available. Granite, on the other hand, is an igneous rock that starts as magma beneath the earth’s surface. When the magma cools, millions of years of sustained pressure transforms the rock into strong and durable granite. Unlike marble, granite comes in a wide array of colors. When deciding between granite and marble, it’s important not to confuse strength with durability. The ancient Romans used marble to build beautiful architecture, and many of their structures are still standing today, so we can conclude that marble is indeed strong. However, it’s not durable. Marble is very porous, meaning that it tends to absorb anything it’s exposed to. That’s why if you spill red wine on a white marble countertop, it could stain. Marble is also more prone to chipping and scratching than granite is. So, yes, the marble will last a long time (strength), but it will wear down (lack of durability) much quicker than granite will. Therefore, the durability, strength, beauty and low-maintenance of granite make it the best stone kitchen countertop material. At Marble.com We have thousands of granite varieties to choose from, and I found so many beautiful granites. Bianco Antico, Copenhagen, Balthus, Polar Ice… Now, these are all white stone like marble typically is, but they don’t have the same aesthetic as marble. So if I went with any of these options, I could get at least some of the look of marble — but not the beautiful texture or veining you find in actual marble. There just aren’t any white granite varieties that look exactly like marble. Beautiful white marble-like granite just doesn’t exist. But I still wanted that marble look. I kept telling myself that marble countertops would be a lot more difficult to maintain than granite countertops. But beauty can be blinding, and marble had bewitched me. I said to myself, “Mike, in Italy, almost everyone uses marble. Yes, it stains easier than granite. Yes, it may chip. But that’s why many Italians think marble is so beautiful.” I think the Italians with their rich history of natural stonework dating back to antiquity have figured something out that we Americans usually don’t take into consideration. Americans, it seems, want their kitchen countertops and almost everything else to look like new all the time, but in Italy, they like their materials to exhibit life and character. Even when aging marble begins to show signs of wear and tear, that adds to its beauty if you ask an Italian. Thanks to Caesar, my mind was made up. I chose marble for my kitchen, and I haven’t regretted it once. Every morning when I wake up and head to the kitchen to make my coffee, I gaze upon my kitchen and fall in love with it all over again. I am completely in awe of its beauty. Marble was the best choice for me, but it’s not for everybody. Granite is probably the better choice for most people, especially Americans. But if the Italian way of judging a material’s beauty holds any sway with you, then marble may be the way to go. Please pardon the pun, but deciding between marble and granite is truly a hard choice.